We spend a lot of time researching the gadgets we use, but often gloss over things when it comes to accessories. That seems to be especially true in the case of power, where most of us just sort of use whatever battery or charger we have on hand—convenience is the most important thing. But if you look into the matter, not all batteries are created equal. 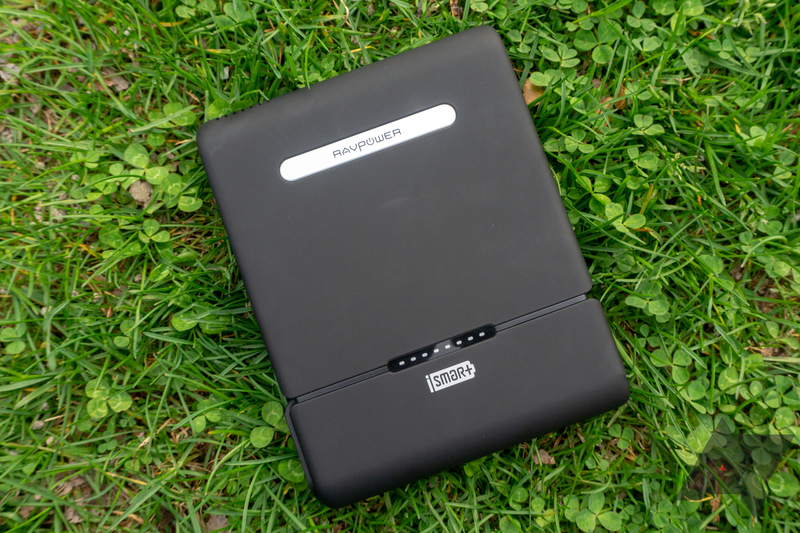 Thankfully, RAVPower's 27,000mAh, 110V AC-compatible battery has some decent specs in an inexpensive package, and we've got a coupon that makes it even cheaper. It isn't perfect, by any means. I'm not a big fan of the lack of USB-C charging, the finish, or some of the power limitations. But for $130, it compares favorably to the competition. Better, RAVPower has offered our readers an exclusive $34-off coupon for Amazon (APRAV055), which brings the price to an even more palatable $96. In an SEO-optimized listing, RAVPower calls the battery the "AC Outlet Portable Charger RAVPower 27000mAh 100W(Max.) Built in 3-Prong AC Plug Universal Power Bank Travel Charger (AC Power Indicator, Type-C Port , Dual USB iSmart Ports) [Updated Version]," but I'm going to refer to it mostly by brand name and capacity in this review. Port location All the outputs are on one side, which is perfect for use in a bag. Capacity 27,000mAh is a lot. Price $130 ($96 with our coupon) is inexpensive for the specs. Outputs USB-A, USB-C, and 110V AC cover all your bases. Power 15W over USB-C isn't a whole lot, and 70W over the 110V AC outlet may not be enough for some. I wish it spat more. Materials Soft-touch rubber is unpleasant at best, and it doesn't last. Capacity, again It provides power for a shorter period than we'd expect. Obviously, it can't offer the full advertised 27,000mAh, due to differences in voltage and losses to heat, but it doesn't last as long in the same workloads with the same devices compared to other batteries we've used. 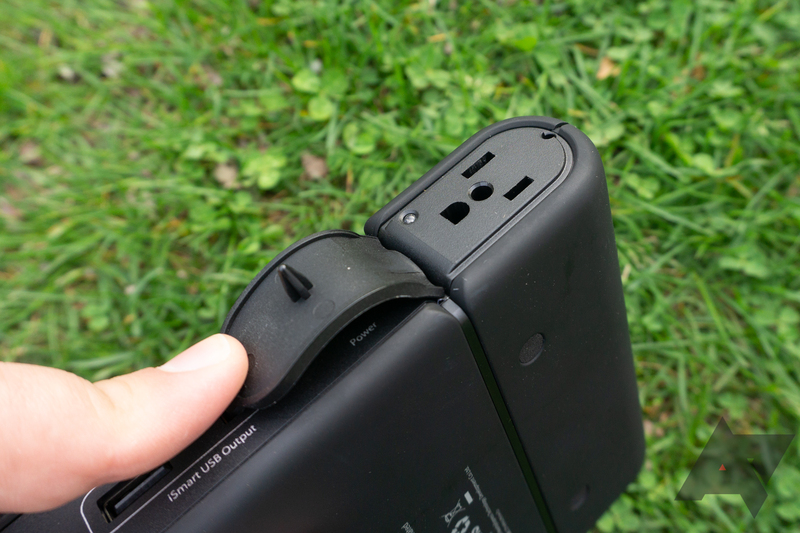 The battery is a mostly square design, with a narrow band traveling all the way around it, interrupted twice by the illuminated battery meter on the front and the flap covering the 110V AC outlet. The front, back, and two curved sides are plastic with a black soft-touch rubber finish (shudder), and the remaining flat sides are matte black plastic. 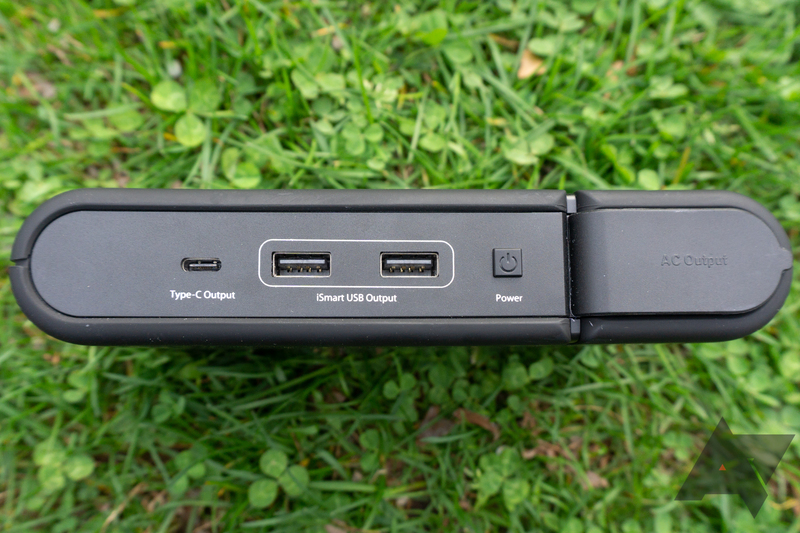 They're also where the various ports live, with all the outputs (USB-C, 2x USB-A, and 110V AC) on one side, and the sole 19V barrel input and 2nd passive vent on the other. One of the curved sides also has an active fan-powered vent. Not everyone will agree, but in my opinion, soft-touch rubber is gross. See all the fingerprints and smears of grease and moisture on the photos above? You just can't avoid them. Ardently wiping with a plush, absorbent microfiber towel, that oily sheen is back the second it touches pretty much anything, and I hate it. Worse, it doesn't age well. Every high-wear device I've had that was smeared with the stuff eventually gets huge gouges in the finish, and the abuse we heap on an external battery is pretty much the definition of high-wear. I might hate the finish, but I like the overall design otherwise. 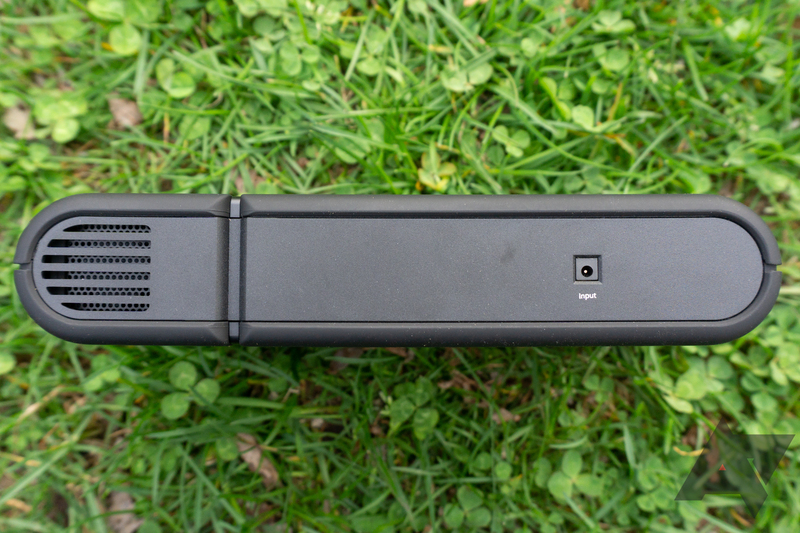 For one, the battery's various outputs are all on the same side, and that's ideal. It's a small but significant detail, but you'd be surprised how many manufacturers mess it up. Most of us are probably going to use this from inside a bag at some point, and it's a lot easier to plug stuff in if all the ports are on the same edge. The battery also comes with a zippered clamshell travel case, handful of cables, and a mesh net bag. RAVPower advertises this battery as pushing 100W, and that's true, but it isn't the full story. That's 100W combined, including the 110V AC outlet. 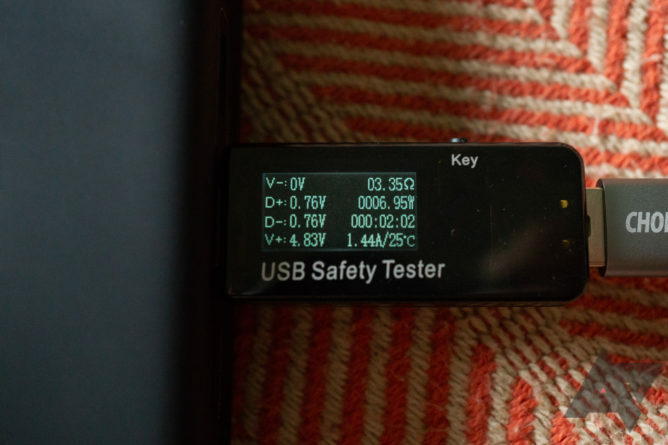 If you're looking at just the USB-C port, it's only able to push [email protected]/15 watts. That's... not a lot. Might be a bit difficult to see here, but (thanks Gohan040) the meter reads 4.55V, 2.89A. In my own testing, I was able to mostly confirm the advertised numbers, with a few watts being lost before it hit my meter. For most phones, the 15W over USB-C should be plenty. The Pixel 2 XL can't even pull that much for very long. Most phones shouldn't have any problem with it. 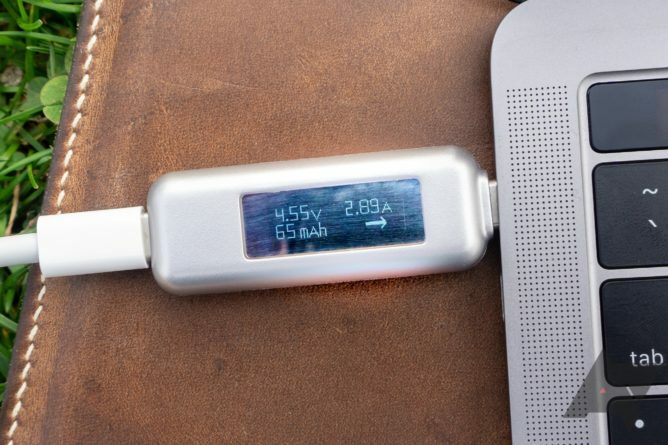 Over USB-C, expect to see a steady drain on laptops. If you use that USB-C port for your laptop, though, you'll probably be dissatisfied. 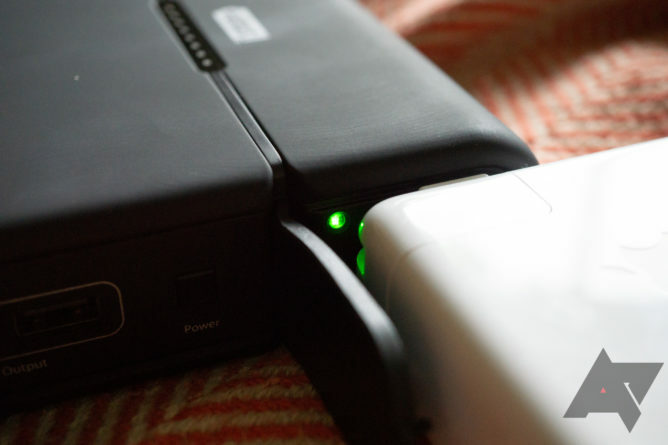 The Mophie Powerstation AC I recently reviewed was able to spit 30W, and while that wasn't enough to keep you charging under a heavy load, it was enough for most circumstances or mixed idle use. 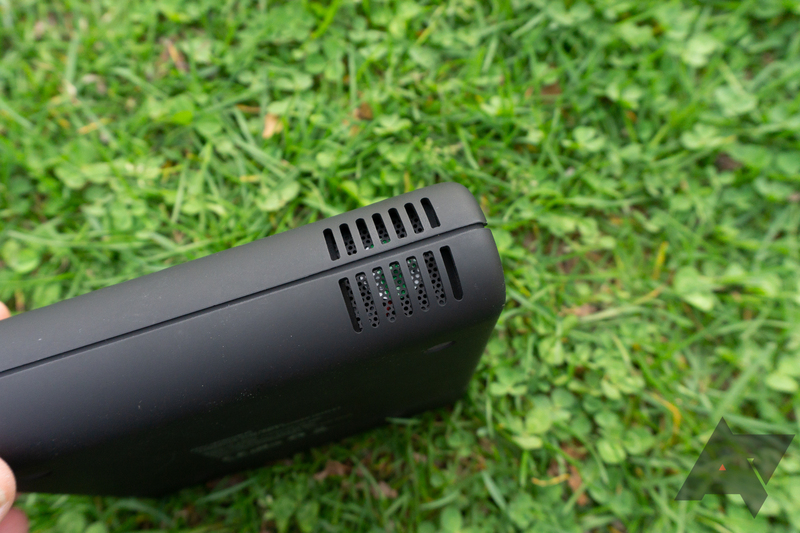 That isn't the case for this RAVPower battery's 15W output, though. It isn't enough to keep you from losing charge at a bare idle when it comes to many computers. Unless your screen is off, odds are your laptop won't be able to charge off USB-C with this battery. 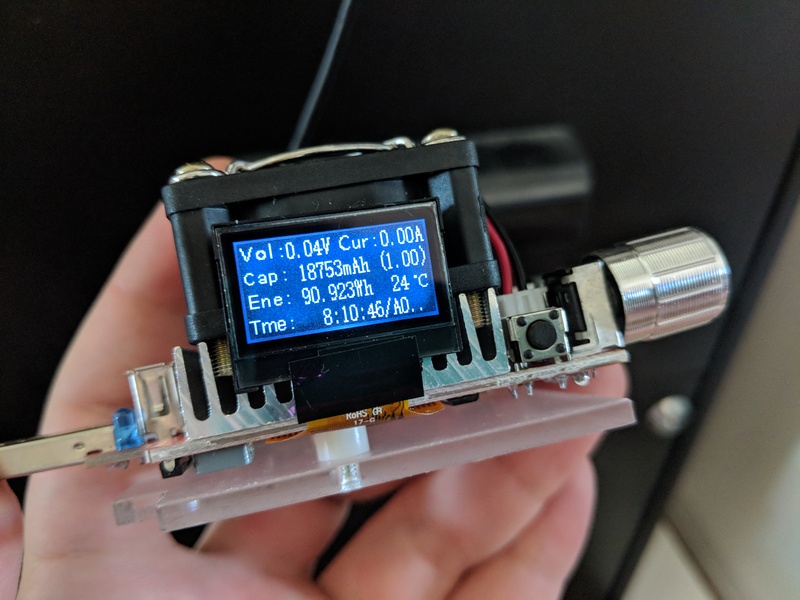 I wasn't able to exceed around 1.5A on the USB-A ports with any of my hardware, but that is likely more of a device limitation than an issue with this battery. It should support up to 2.4A, assuming your phone can pull that much. If you press and hold the power button for ~8 seconds, you enable the built-in 110V 3-prong outlet. It works pretty much as you'd expect: Plug in something, and it should be able to pull up to 70W of power. The other USB outlets also continue to function up to a combined 100W output. I tested the 110V outlet with my MacBook Pro, and it was smooth sailing. 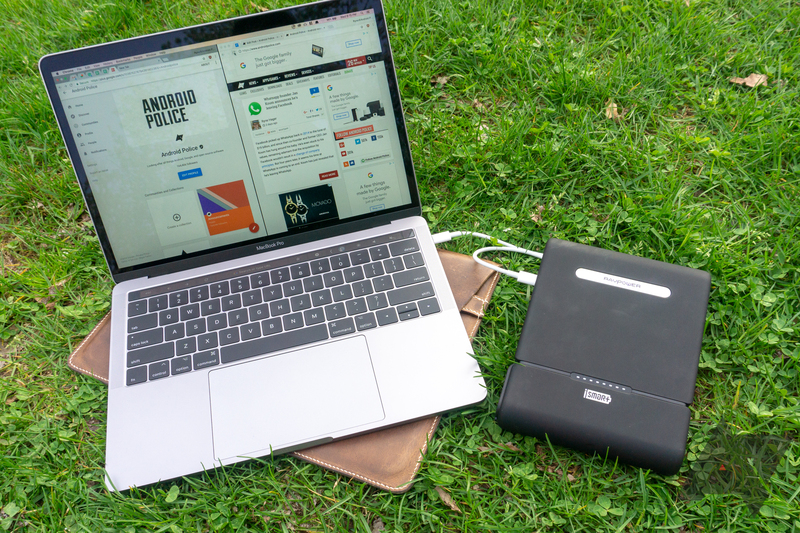 Although I couldn't pull more than 15W over the battery's built-in USB-C port, with the provided 110V outlet and a more powerful charger, that can be mitigated—though that outlet's 70W maximum output can present its own limitations. My 60W USB-C charger worked fine, but other higher-wattage chargers may hit that 70W wall. I'd rather have seen RAVPower provide something closer to 100W of output over the AC port, as in the case of Mophie's Powerstation AC. Short of USB-C wattage limits, I do have a few other complaints. I'm a bit dissatisfied that this battery has to charge with a barrel connector, rather than USB-C. With how universal the standard is these days, it's a significant omission and an inconvenience. You can't just pack one charger with the expectation that you can top up all your gadgets as required. Traveling with this battery means carrying a minimum of two chargers. There's also something strange going on with the battery's capacity. There are a few potential explanations (which I'll get into), but for whatever reason, the available capacity here is lower than I would expect and seems to be lower than other explicitly smaller batteries I've tested. 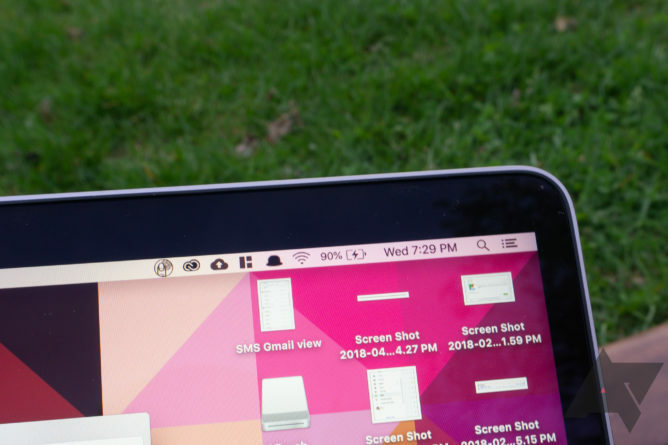 Without the right hardware to accurately measure a difference in watt-hours, any evidence here is purely anecdotal, but in back-to-back testing, the smaller 22,000mAh Mophie Powerstation AC was able to provide my laptop power for longer periods. There could be a few different reasons for that. The circuitry in the RAVPower could be less efficient than the Mophie, resulting in a greater than expected loss during discharge. Or, the controller for the battery may not have calibrated to full capacity during the short review period—it's only been fully cycled less than 10 times. Or, it's possible that my battery is faulty in some way. Without more time to test, I can't be entirely sure. It isn't a huge problem. The capacity is still adequate, and the numbers provided by battery manufacturers are always a little bit useless anyway. 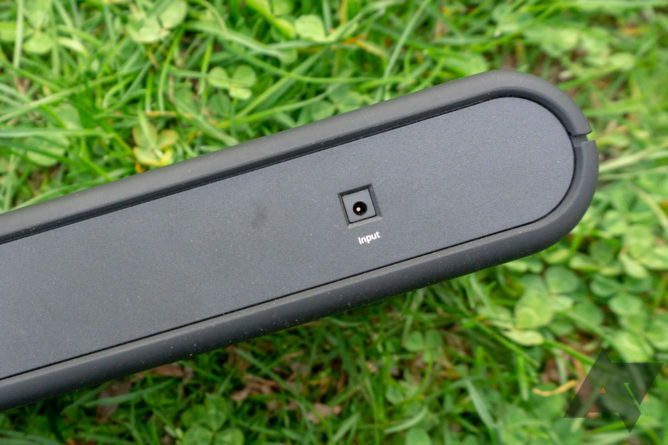 RAVPower's 27,000mAh 100W AC Power Bank has a few significant limitations. It doesn't charge with USB-C, it can't provide more than 15W over USB-C, it maxes out at 70W over 110V, and it's made of a fingerprint-attracting, low-durability material. And every one of these limitations isn't present on Mophie's Powerstation AC. But, I'd still recommend RAVPower's battery over the Mophie, for one simple reason: It's just $130. Better, it's been discounted to $96 with our limited-time coupon. In comparison, Mophie wants $200 for its battery, and I'm not sure that it's worth twice as much. In most cases, this RAVPower battery is perfectly adequate. It won't charge your laptop over USB-C by itself, but with an AC adapter that's not a concern, and 15W is enough for a phone. The 70W cap for the AC outlet might limit the number of mini-fridges you can power, but for the majority of laptops and other less power-hungry devices, it should be fine. 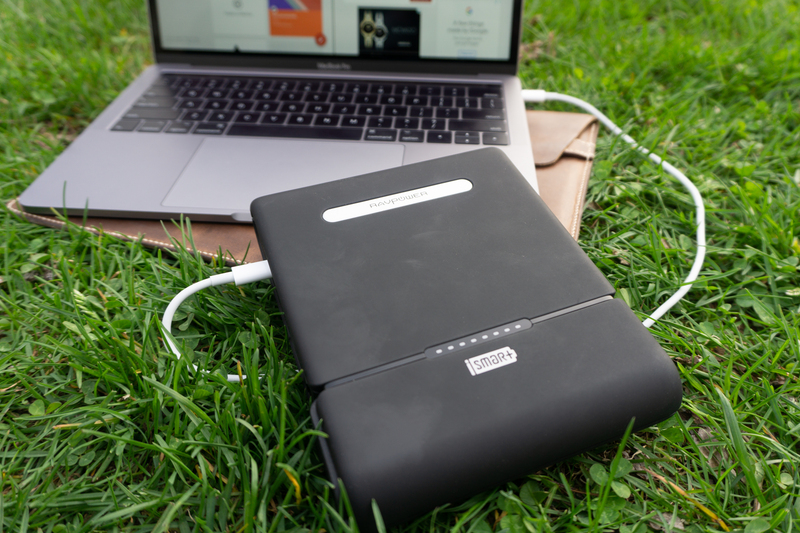 RAVPower has also offered our readers an exclusive coupon for this battery, so if the above limitations don't preclude your interest, you can even save a bit of money picking one up. Keep in mind, the coupon is only good until the end of May.